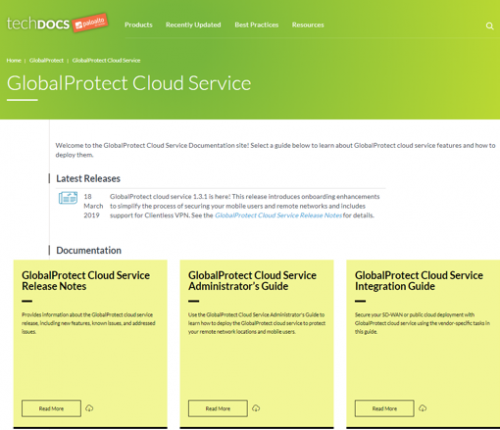 GlobalProtect Cloud Service Documentation Has a New Home! You can now find all technical documentation for GlobalProtect Cloud Service in one spot. A reorganized Administrator’s Guide that describes how to plan, install, set up, and configure GlobalProtect cloud service to secure your network. A new Integration Guide with vendor-specific tasks that show you how you use GlobalProtect cloud service to secure your SD-WAN and public cloud deployments. In addition, we also recently released GlobalProtect cloud service 1.3.1 which includes improvements to make onboarding and implementation easier. Here are some feature highlights. See the Release Notes for a complete list of new features. 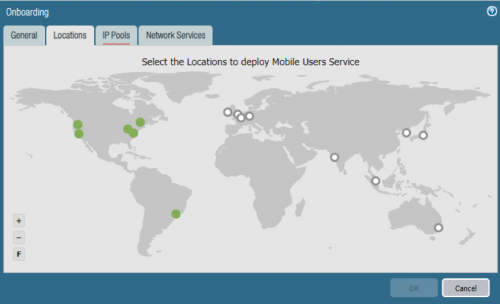 Region Selection – Gives you a graphic list of all available regions where you can deploy your mobile user locations, which gives you more granular control over deployed regions and allows you to exclude regions as required by your policy or industry regulations. Reduced IP Address Pool Requirement for Mobile Users – Reduces the minimum subnet you can specify for an IP address pool for mobile users. Predefined IPSec Tunnel Configurations – Upgrading the Cloud Services plugin automatically adds predefined IPSec tunnel profiles for some common third-party IPSec and SD-WAN devices, and a set of generic templates to use when those profiles don’t apply. Clientless VPN Reverse Proxy for SaaS Security – In conjunction with Aperture, allows you to control unsanctioned and employee-owned device access to your network and redirect device traffic to GlobalProtect cloud service for inspection without putting your network or data at risk. 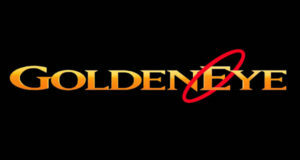 Clientless VPN Portal – This release supports Clientless VPN. Support for Overlapping Subnets for Remote Networks in the Same Region – A new Overlapped Subnets selection allows you to deploy remote network locations with overlapping subnets in the same region (for example, for a guest network at a retail store) for internet outbound only.